The beat, The Singularity unleashing her divine Higgs Boson. & the notes are merely the debris from the emotional dwelling. but words can not often weep, angst or console like that of a musical composition. Inside is a sickened awareness, one for which the body has built no immunity. Us Two Spirits & NDN Trans can listen to the Mountains & hear our Slain Ancestors wailing in the distance. Their blood crystalizing to fine obsidians hardened under 500 years of Colonial Pressure. Oh Sacred Mountains, calm their Spirits as Grandfather Sun soars like an Eagle above the Mountain Tops to soothe the wounds. Feeling is a Circle, Survival is Ascending. What Warrior has no Scars? What Warrior has seen no battles? Our Two Spirit Siblings paid a high price for such a small percentage of us to survive. You there, you are Sacred & I am Sacred too. Every one & Every being provides a purpose. No purpose too small, for even our Beetle Brothers & Sisters bring us a Message. We too rise like the Sun, often eagerly to make our round about the day much like Grandfather Sun & Grandmother Moon. But us Unorthodox Creatures, not confined to The European Standards of Sexual Orientation or Gender, our sunshine can often be dimmed by The Hailstorms of an Apathetic Society. We are not your Punching Bags, we are not the reason why you feel dissatisfaction in your life. With as many of Antagonizers that we do encounter, sure we could use a Punching Bag too but what is the Use? We only return the ugliness when provoked & it is not because we hate you. We just want to survive. We do not hate you. We crave a good quality of life. Life without fear, life without feeling the need to look over our shoulder. A life where we can safely close our eyes to feel Grandfather Sun kissing our skin with no worries in our mind. We only want to survive 500 years more & then let the future generations survive 500 years after that & so on in an unbreakable chain of perseverance. Be Gentle with us in your Modern World. It is your Ancestors who literally fed our Two Spirits to The Wild Dogs. 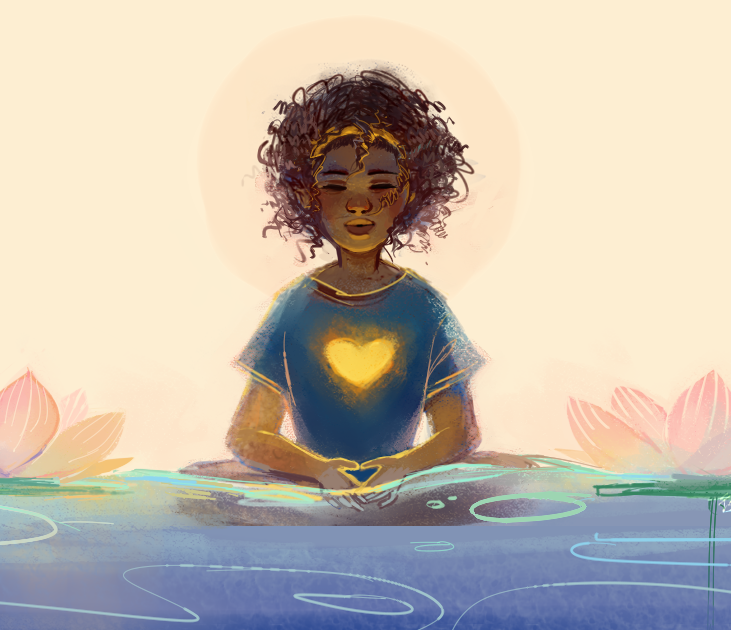 Be Gentle with us so that you may begin to understand the Medicine we bring. Calm you Child in my memories born into secrecy & lost from your Nde people. We are halfway there on our journey & we will earn new feathers some day. Be patient & hold your fervor like brother Tortoise. We have made it this far. We need community support to continue publishing! Articles and artwork like these are only possible through your contributions. 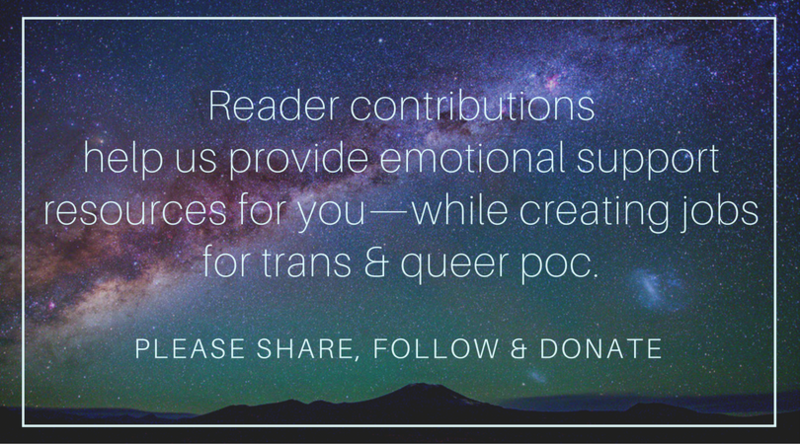 Please donate today to sustain the wellbeing of artists, writers, healers, and LGBTQ2IA+ people of color. a Rest for Resistance print zine. An indigenous person wears colorful clothing while sitting on top of a large green turtle that rests on a maroon crescent, the turtle emits tears from their eyes, and the tears fall into a river of skulls. From the crescent grows plants like pumpkins, corn, and small babies; behind the indigenous person there is a sun looking out into the distance. Paulino Mejia is a Ch'orti Maya artist who lives in Fort Lauderdale, FL, and has worked with different art mediums throughout their life. Currently, Mejia specializes in ceramics and beadwork; 22 year old Paulino has identified as two spirit for three years now. This identification began after learning how sacred the two spirit identity is to their nation, and to native/indigenous communities through the world. Marcy Angeles is a Two-Spirit Apache Writer, Painter & Musician from Southern New Mexico. Her main Solo Music Project is Allophane, a whimsical Trip Hop outfit. Also - Western Obsidian, an exploration of Trauma placed on her Native American People for generations. She has also composed Shoegazey Noise Rock under the alias Fleurish. Her Artwork has been exhibited across the Borderland. Marcy Angeles’ paintings & poetry have been featured in Barrio Panther Magazine & in the 2017 issue 5 of Parallax Magazine. Marcy has been one of the many Two Spirits working to restore their place by the Sacred Fire. It is one thing to be Transgender & a whole other to be an Indigenous Transgender Woman. I was constantly exhausted pretending that I was always okay. Trying to prove to myself that maybe I wasn’t bipolar. I distract myself. I call someone and ask them to remind me of what’s good about me. I play video games or read books that have nothing to do with triggering topics. I take a nap. I drink hot tea.